Heard the author, Piers Paul Read, interviewed yesterday on a talk radio show as I was out running errands. The book sounds good, and is available from Ignatius Press. 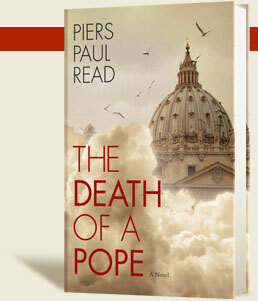 There is also a website for The Death of a Pope. If you love the Catholic Church, you will probably love this book whether or not you love a good story. If you love a good story, you will probably love this book whether or not you love the Catholic Church. But if you love both the Church and a good story, you will certainly love this book. Anyone read any of his other stuff? Edited to add: I finally figured out what I had read that he had written! Alive--the book about the survivors of the plane crash in the Andes! Thank heavens. Now it won't rattle around in my head all day. I really liked this. Good pacing, quick thriller plot but with a bit of meat to chew on. I loved the ending. Made me want to go read Alive. I think you'll enjoy. This page contains a single entry by MamaT published on July 1, 2009 8:29 AM. smock's challenge for pretty pattern tuesday was the previous entry in this blog. Summer = Crafts at CasaS is the next entry in this blog.